In the Booth provides premium Perth photo booth hire. 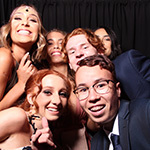 We love attending events and bringing photobooth fun right across Perth including Joondalup, Fremantle, Mandurah and also travel to other locations such as Bunbury and beyond. The Perth lifestyle is magnificent and there is something here for everyone. Whether you are planning an event surrounded by our natural beauty, historical buildings, stunning beaches or urban chic, Perth has the location and venue for you. For any celebration, we have the best photo booth hire Perth has to offer! Whether you are planning a vineyard wedding, a beachside party or city based conference, our photo booths will bring entertainment and memory making at their finest! In the Booth has been bringing photo booth fun to events in Perth, Margaret River and beyond since 2012. We’ve attended countless Western Australia weddings, parties and corporate celebrations and are dedicated to surpassing customer expectations in all we do. In the Booth WA are accredited members of the Australian Bridal Industry Academy (ABIA). We are honoured to have been awarded the title of Western Australia’s #1 photo booth for 2015, 2016 and 2017, as rated by our past customers. If you’re looking for the ideal ice break for your Christmas party or entertainment for your wedding guests (when they’re not on the dance floor! ), an In the Booth photo booth will have your guests raving about your event long after the confetti has been swept away. We’re in the business of creating lifelong memories for our customers and their guests and we’d love the chance to create some for you. For Perth photo booth hire, please get in touch. "On behalf on myself and my wife Ellysha, we would like to THANK YOU GUYS SO MUCH for attending our wedding on the weekend! Everyone enjoyed the photo booth and your video teaser is amazing! We can’t wait for the folio to arrive! Hope to see you guys at more Malay weddings in Perth." "The ball was a wonderful event for the students and I know that the photo booths were very well used. Thanks for your professionalism and attendance on the night." "Thank you so much for your wonderful service and attendant at our wedding. 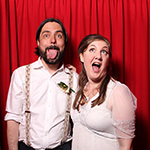 Everyone absolutely loved the photo booth and had a great time - so lovely to have the album of photos as part of memories of our wedding!" "Just wanted to say thank you so much for the amazing photo booth at my engagement party on Saturday night, all my guests absolutely loved it and were raving at how helpful the booth attendant was. Thanks!" "Thank you so much for coming to our wedding, it was AMAZING! Awesome. Seriously, it was such a good booth. We had the best night and so nice looking at the photo book at the end of the night. Great memories. If you need a review or recommendation let me know we would love to give you five stars!" "Thank you so much guys, we received all our images and USB yesterday from our wedding, so great looking through all of them! The photos are such great quality and great to relive the day. Thank you so much for everything." What is it you love about providing photo booth hire in Perth? No day is ever the same in Perth. One day we can be boothing it up over looking the city and Swan River from Fraser’s at Kings Park and the next we can be taking our photo booths out to gorgeous wineries such as the magnificent Oakover Grounds or the magical Caversham House. In the Booth Perth is fortunate to be surrounded by other spectacular event locations such as The Swan Valley, Fremantle, South Perth, Cottesloe, Hillarys Boat Harbour, Nedlands, Darlington, York and the endless array of top venues in Margaret River and our South West region. Tell us about some uniquely Perth touches you have seen at an event? The uniqueness of Perth is demonstrated beautifully by the diverse range of venues we have at our finger tips. All venues are special in their own unique way, however we have had some especially interesting backdrops for our photo booths at uniquely WA venues such as The Aquarium of WA, The WA Museum and the Perth Zoo! What is the most common question you get asked about the photo booth hire you provide in Perth? We are regularly asked ‘can we please have your photo booth at this venue we have booked and will it suit the theme?’, or, put in other ways: Does it go up stairs? Will you fit through a small door frame? Will you travel to Margaret River? Can you match the theme of my wedding? We get asked these questions all of the time and the truth is we love a good challenge! The other great thing is, because of the unique nature of our photo booths, we can get into most hard to reach locations and have yet to meet an event theme that we haven’t been able to tweak our many customisable options to suit. Try and relax and enjoy the moment with your closest friends and family. Stick to your budget and think outside the box for creative ideas and of course hire a photo booth! A photo booth will provide the fun, get guests interacting with each other and provide you with long lasting memories after your event. Take a drive along our fantastic coastline and enjoy the gorgeous beaches and weather. Then head to the Swan Valley to experience the delights of local produce and vineyards and some of the best restaurants in a picturesque setting. Head up to the Bickley Valley, through Lesmurdie, Darlington and Kalamunda to see some of the best views and meet some of the family operated venues.